ITW Fluid Products Group is the leader in scientifically advanced fluid products for the , metalworking industry. Natural-based Accu-Lube lubricants are formulated to provide superior performance, economy and safety compared to conventional water-soluble coolants and cutting fluids. 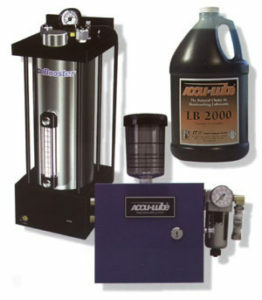 Accu-Lube standard applicators are available for most metalworking operations, and our engineers can design a custom micro-lubrication system for any special or standard application. Accu-Lube applicators regulate the lubricant supplied to the cutting edge in exact quantities – no guesswork. Lubricant is carried by air, with pinpoint accuracy onto the cutting edge. Hazardous atomizing and “mist” are eliminated. Additional pumps and automatic on/off controls (electric solenoid) can be added in the field. Just order a complete pump assembly or a solenoid valve. This process is limited to the box size. 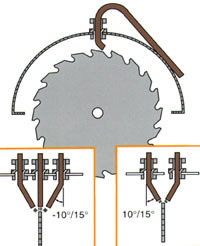 Minimal or no equipment modification is required for system installation. An electric or pneumatic timing device (frequency generator) with a 5-120 stroke per minute control range for electric timing device and a 5-180 stroke per minute control range for pneumatic timing device. Easy lubricant and air flow adjustment. Multiple on/off controls: manual switch, solenoid valve, foot pedal or air pilot valve. Multiple nozzle types available: Copper, Stainless Steel and Loc-Line with Magnetic Base. Nozzle Positioning for Milling Lubricate the cutting edge. before it enters the cut. Follow the cut. Nozzle Positioning for Drilling/Tapping Lubricate the drilling tip and down into the flutes. For short-run and handheld machining projects, nothing can match the quality of Accu-Lube Products. All are environmentally safe, non-toxic and cleanup with soap and water. of the finest organic cutting lubricants at your fingertips.